No, I did not fall off the face of the Earth. I'm still adjusting to being back at work. And we're still painting the damn house!! That is what is really taking up all my time. Right now I have a fabulous work schedule that will actually work quite well for swatching and blogging, so if we could just finish that painting! I did have an opportunity to paint my nails this weekend and, since so many of you were chomping at the bit like I was, I opted for one of my new pretty Diors, Timeless Gold. More swatches and my idle musings after the jump. I would categorize Timeless Gold as a neutral gold. In some lights it looks quite pale, and in others, it is more of that rich-toned gold. It is a metallic polish, but amazingly the brush strokes are absent (at least on me, with my careful application...no, I'm not joking, I was quite careful in painting my nails). I do wish it had been sunny so I could've captured the prettiness better, but I did what I could...that last pic was taken during a brief moment of sunshine. FYI, I did two coats to achieve opacity. 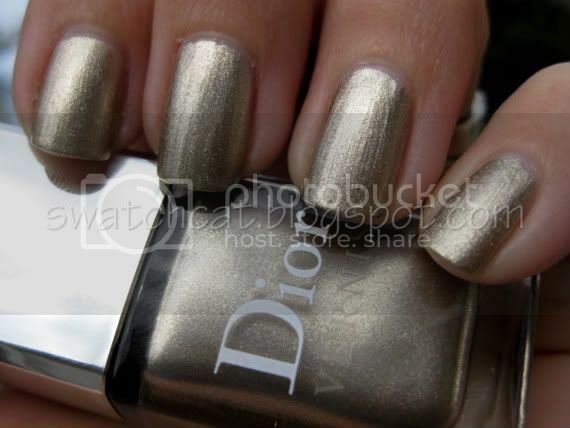 Timeless Gold does strike me as similar to OPI Glizterland (Fall 2010), but I do not think it is as blindingly shiny, nor does it have those multi-tonal flakies that Glitzerland has. If you're looking for a toned-down version of Glitzerland, then this is the color for you, and in the same vein, if you're looking to save cash, Glitzerland will do the trick for less than half the price. I do want to do comparison swatches, but again...the time-thing.